First comment! So excited for this. Ooooh! Time travel. This one sounds fun. Not a dot. More like I think Yog-Sothoth and maybe some other that don't like time travelers messing with stuff MIGHT show up. Like THAT guy! I can see Aeons, some Inevitables, and Hounds of Tindalos being quite annoyed by these chronal antics. Well, judging by the cover it looks like Yog-Sothoth is involved. If he's on Alaznist's side, she's got nothing to worry about. I know it's a placeholder, but there's a definite pattern when it comes to what Paizo puts on their placeholder art. It's usually at least tangentially related to the adventure itself. For example the adventure prior to this has a kyton on it and involves the PCs going to the Plane of Shadows. The adventure before that has an asura, so I'm guessing asuras are involved. Etc. Is that supposed to be Yog? I seem to recall this entity that stood in one place and kind of rotated around and would say various prophetic things about cosmic events. Had some kind of 'halving' power where it could slice up people's essences. 3 Runelords down, 4 to go. I was hoping the BBEG would be Sorshen or Xanderghul, but I have a feeling they're both too powerful for a non-mythic party to take done. Ah well. 3??? Are you counting Alaznist as the 3rd? Hah. 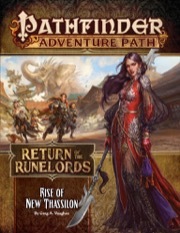 I suspect a lot of folks are gonna be surprised, shocked, and delighted by the role the runelords have in this Adventure Path. Yup. Sloth, greed, and wrath have now been accounted for. Seriously, though, I would laugh a lot if the players get to team up with Sorshen. After Shattered Star that would raise some eyebrows. I'm pretty sure they'll team up to stop Mhar. That's about all I got. Not really possible because we know what happened to first Runelord of Lust, Pride and Wrath and first Runelord of Greed's name was dropped in Xin-Shalasts background info. Timetravel can create new facts. Also there are seven different Runelords and four players. As far as i lnow we don't know their names yet. They’re the same Runelords. There wasn’t “Runelords of Virtue” and “Runelords of Sin”. Just Runelords. Aka the school of Divination. Doesn't one just claim the title and lay waste to dissenters? Krune, last Runelord of sloth, got his position when his predecessor (Runelord Ivarinna) peacefully abdicated and granted her rulership to him. The first Runelord of wrath is still alive to this day, though he clearly lost the title. I'm sure there are more examples. Trickery, blackmail, bribery, nonlethal duels, imprisonment, etc. etc. I have a feeling that Thassilon is set for a modern revival. That would be a cool switch up for Pathfinder 2nd edition - Varisia may well have a makeover, wherein the 10,000-year-old kingdom rises again. I too think that a sizable part of Varsia will be replaced by "New" Thassilon, which may very well be part of the actual old Thassilon displaced through time. Most propable it will be "the city outside of time" from last month's AP, which reminds me of "Kandor, the city in a bottle" from Superman's homeplanet Krypton. A certain time travel-related device in a certain chamber in a big building in a huge city that is hidden somewhere up in Kodar mountains definitely comes to mind when I read the description of this book. What role will New Thassilon play in the future indeed, as it sounds it will rise and stay there. Will the world map change again once again? I wonder if Riddleport's Cyphergate will actually be put to its intended use? As I understand the Cyphergate, and other gates like it are Elven creations for interplanetary travel, or occasionally local/dimensional travel. I'm not sure how they connect with the Runelords? 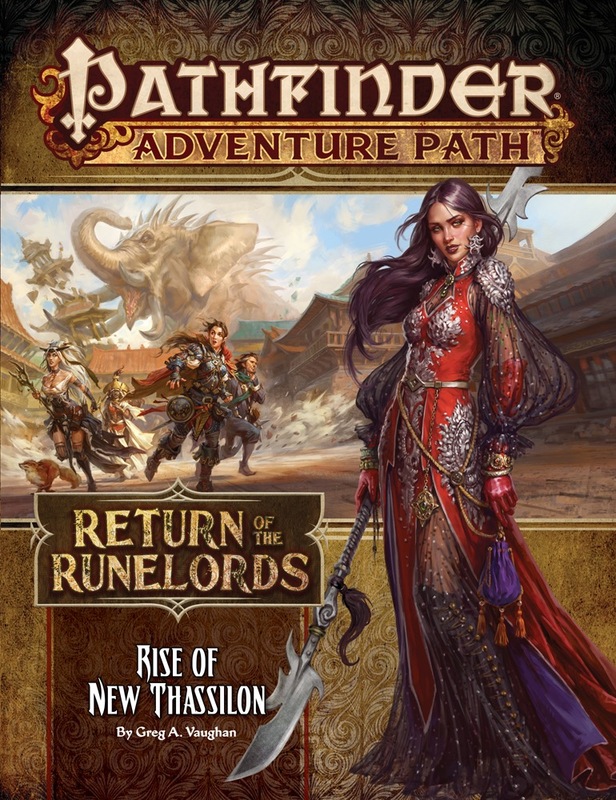 Rise of New Thassilon (6 of 6): The Return of the Runelords Adventure Path concludes as the heroes take steps to confront Alaznist, the runelord of wrath. But Alaznist is more than just a deadly wizard—she's meddled with the flow of time itself, and before she can be stopped, the heroes must do what they can to restore the damage she caused. What strange mysteries and dangers await in the depths of time itself, and what role will New Thassilon play in the world to come? I wonder if this means that Alaznist will be sending Constructs back in time cloaked in Human flesh . . . .
First volume had Yamasoth, and second had Lissala. Following the pattern of the previous volumes, that had back matters related to the Runelords in the cover, it would be cool if this one, that has Shorshen in it, had something about the Redeemer Queen. Might I dream with an illustration of a more composed/less demonic illustration of the "goddess" herself! I'm not sure I'd use "alive" either, mostly because if I recall correctly he's actually managed to turn himself into a lich.